Last month I wrote about how much I enjoyed Jeff Stormer’s podcast Party of One. The show consists of quick one-shot RPG sessions starring a game master and a single player. Some of these are very funny, others more exciting. With a new player and story every episode the tone can change dramatically. I’m talking about the podcast again because I got to record with Jeff and that episode is now available. That’s right, if you ever wanted to sit around a game table with me run over to Party of One’s Soundcloud page or look it up on Apple’s app store or Google play. The game I got to play is called Atomic Highway. It’s a perfect system to get that Mad Max style you may be interested in after watching Fury Road. Our game took that formula and mixed in equal parts 50’s style Sci-Fi. The basis of the game is I’m playing a literal Frankenstein’s monster who makes a living as a courier across the wasteland in his armored muscle car. I’m in love with the character and the setting, so if you enjoy the episode you should let Jeff know how much you love Vic Frankenstein. To protect itself the human mind is capable of ignoring those truths that would cause it shock and damage. Things that would demoralize the populace were trivialized and transformed into myth and legend. Yet even before the great disaster there were monsters roaming the Earth. The members of the Frankenstein bloodline had guarded Victor’s original work closely. Passed from generation to generation the burden caused most family members to hide themselves in the remote, hard to reach corners of the Earth. When the End Times came, Henry Frankenstein and his wife were already safe deep in a compound hidden in the Sierra Nevada mountain range. Time passed and Elizabeth bore Henry a son. But times had changed and even a routine delivery was no longer as easy as it once had been. Elizabeth died not long after Victor was born. Henry was a warm and caring father and did everything he could to make sure his son was protected. Young Victor grew up with a hunger for learning. He was a teenager when the raiders had found the Frankenstein compound. While he and his father had managed to fend off the attackers, Victor was struck with a bullet through the heart. The boy died almost instantly. Henry’s grief was unbearable; he had lost everything. Except he was a Frankenstein, he didn’t need to let fate dictate who lived and who died. The dead raiders provided more than enough material. Vick was not Victor, the personality was different. The memories of the past were gone. Vick was less studious and wilder, but Henry loved him anyway. The two lived happily for many years until Henry’s age had finally caught up to him. Vick mourned his father but knew he couldn't hide from the world much longer. Sealing up the compound Vick loaded up his car. It was like him, an amalgam of the cars the raiders had attacked in. He headed out into the wasteland to sate his wanderlust, to finally see the world that was beyond the mountain peaks. 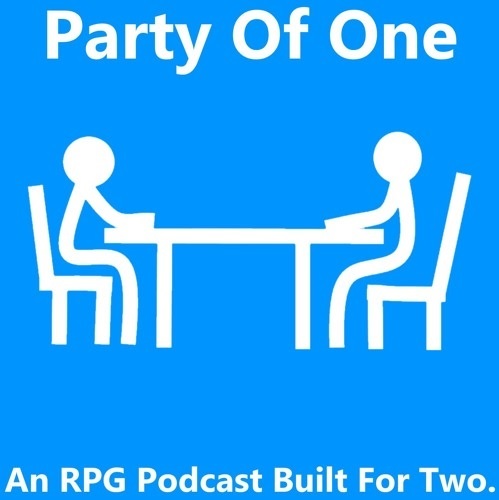 Party of One podcast can be found HERE.